This prop acts to deactivate an electromagnetic lock once the four programmed speech commands are said in order, and within a certain time frame. The above video shows you a complete demonstration of how this works. If after watching the video, you have questions, please do not hesitate to send us a message through our contact page. 1) Plug the power adaptor into the control board to power up. 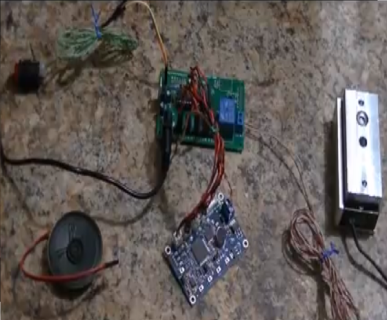 2) On the speech recognition board, plug in the speaker, as seen in the above video. 3) The four buttons on the speech board are labelled Key1 through Key4. Press the Key1 button on the speech board. It should say "Synchronise". After that, press 2/3/3/2/1/4. If you've done this quickly enough, the unit will say "Enter program mode - Please press a key to train a command". 4) Press Key1 to program in the first command. The unit will tell you to repeat the word once programmed. As long as the same word is said both times, the unit will then allow for you to program in commands for Key2, Key3, and Key4. Once done, the unit will say "Training completed - Enter scanning mode". 5) Now, you can remove the speaker. If you keep the speaker plugged in, the unit will annoyingly announce it every time a correct command has been received. 6) If you say the commands in in order (1/2/3/4), then the mag lock will deactivate. When a correct commands is received, the relative output LED will light up for 500ms, then turn off. You need to wait until the LED turns off before saying another command. 1x Speech board / Control board set (Two boards connected together via cables. 1x Electromagnetic lock set (Connected via extension wires to the control board). Includes bracket and mounting hardware. 1x 12v 2A AC-DC wall adaptor.